Having a junior who is learning how to spell and read forces me to look for a set of apps that could help him. Today I will share about a newly released app from Spinlight Studios, entitled Gappy's First Words, that aims to help your juniors learn spelling and sight words through a fun adventure. Gappy's First Words follows Gappy, a cute rabbit who is trying to get home. Unfortunately, this journey includes going over cliffs. In order to help Gappy, you need to form three-letter words that will become bridges for him to cross. The game has four levels: beginner, easy, medium, and hard. In the beginner level, you only need to focus on finding the missing letter. The narration will guide you to identify a letter based on its name. In the subsequent levels, you will focus more on how to spell a word. You start with one missing letter in the easy level, and work your way up to a blank slate in the hard level. 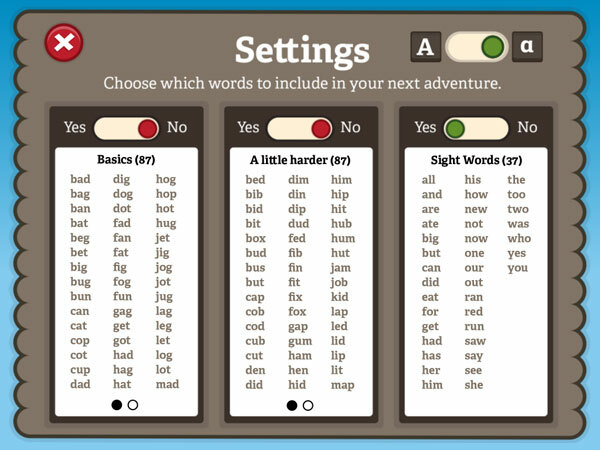 The gameplay is simple and intuitive; to complete a word, just drag the appropriate letter from a set of four choices to its correct placeholder. You need to complete 10 words in order to reach Gappy's home. At the end of each adventure, you will get a random house part, which you can use to customize Gappy's house. There are 54 house parts available in the game, which are categorized into six places: the chimney, the rooftop, the window, the door, the wall texture, and the fence. If you want to add new parts into your collection, you can simply start a new adventure. Gappy's First Words includes a total of 163 CVC (consonant-vowel-consonant) words, and 37 three-letter sight words. These letters are grouped into three sections, and you can select any or even all of them to be included in the adventure. You can also switch from uppercase to lowercase, and vice versa. A nice feature of the app is a custom soundboard containing all 26 letters of the alphabet. You can tap on each letter to hear the phonic sound of the letter, or switch it to hear the letter name instead. I personally find this feature helpful to teach my three-year-old son, Philip, how each letter may be spelled differently from its name. English is not my primary language, and I can't recall being taught sight words or phonics. I can't really remember how I learned to spell in English, but I recognized this problem when I tried teaching Philip how to spell and read. I really appreciate how the app switches from phonics-based spelling to letter-name spelling when it encounter words that can't be pronounced by its letter sound. I was confused with this approach at first, but as I played with the app more, I started to understand the benefit of this switch. For a while, I have been collecting a list of sight words that are available online, such as Dolch Words. I personally feel the list is a bit difficult to teach to younger juniors as it also contains longer words such as little, yellow, and pretty. Thus, when I found out that Gappy's First Words has included as many three-letter sight words from Dolch's list as possible, I am confident that I can use the app to provide Philip with enough practice to learn the basic sight words. Gappy's First Words is one of a few apps that are really good in helping your juniors learn spelling and sight words. It is most suitable for juniors ages three to six. The fact that it packages the learning experience in a fun, playful, and creative environment helps motivate juniors to come back to the app and practice often. Note: Thank you to the wonderful people at Spinlight Studios for sharing the app with us. Gappy's First Words has really helped Philip in learning how to spell. Grandpa's Workshop. Upbeat jungle-themed app introduces juniors to the basics of reading and writing. Tomo House. Interactive game gets juniors building letters and words, literally.